The other day on facebook, Melissa of My Cake School shared THIS very cute cake, and I just knew I had to cookie-fy it! (Thanks for the inspiration, Melissa!) 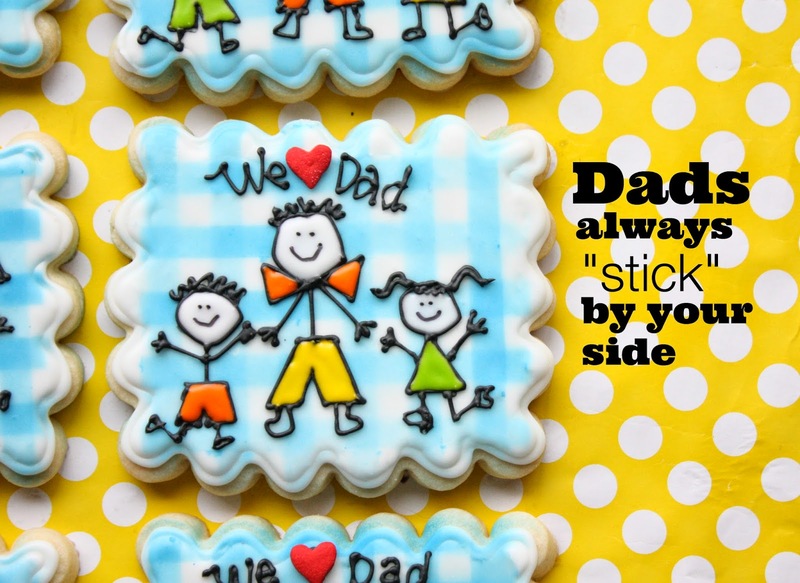 I think they are perfect for Father's Day and the stick people lend themselves to looking like children made them...especially mine, haha! Of course, you can let your children make them if you'd like. I did not make stick people templates, but piped directly onto the cookie with royal icing. The blue gingham base was made using Salsa Sweets' stencil. I love it! 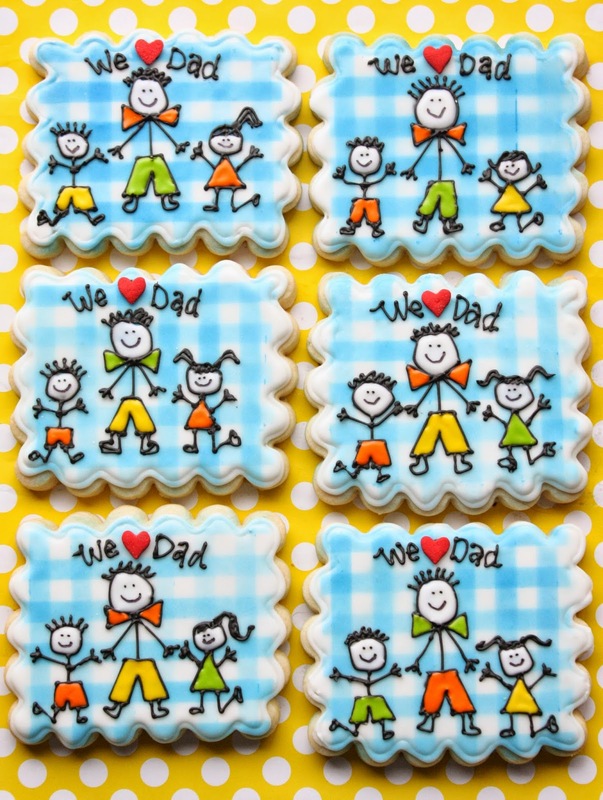 Of course you can personalize these cookies by piping two boys or two girls, or even one child. The cookies are really quite simple. 1. Roll out sugar cookie dough about 3/8-inch thick, and use cutter to cut out cookies. 2. Use a spatula to place on baking sheet. 3. Place in freezer for 10 minutes to help cookies hold their shape. 4. Bake cookies according to recipe, until starting to brown around the edges. 5. Let cookies cool completely. 6. Use white royal icing to outline and fill each cookie. 7. Let them dry for 6-8 hours, or overnight. 8. Place gingham template on each cookie and apply the food color spray. 9. Let color spray dry. 11. 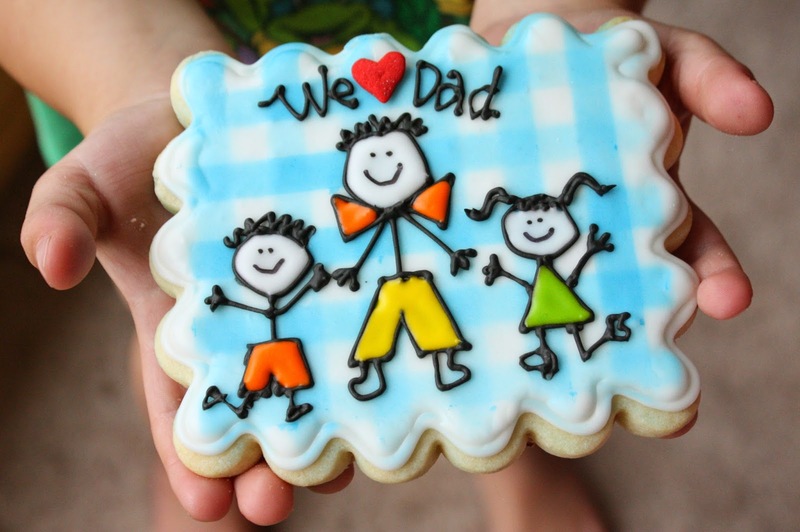 Pipe the words above dad, and with a dab of royal icing add the heart sprinkle. 12. Let the black royal icing dry. 14. Fill in the clothing with the royal icing (I used a #2 tip). 15. Fill in the faces with the white royal icing. 16. Let cookies dry completely. 17. Add facial details with the black edible marker. 18. If you'd like, add tags that state: Dads always "stick" by your side. Finally characters I can draw!! LOVE, LOVE these cookies!!! So cute. I love all the different hair on the girls. That's a fun touch. Haha, gotta love those sprinkles! :) Thanks for your comment, Michelle! why oh why do your cookies have to be SOOOOO cute?!?! do you know what you are doing to my heart?...making it bigger actually :)!